In 2010, the University of Kansas Breast Cancer Prevention Center received a $4.5 million Promise Grant from Susan G. Komen. This purpose of the grant is to investigate whether an estrogen found in flax-seed – a commonly used supplement – can reduce the risk for breast cancer. Kandy Powers, ARNP and Hailey Woods, clinical trial participant. Hayley Woods decide to become a part of something bigger than herself! After hearing about the research study from her local Komen Affiliate, Hayley called the Prevention Center to see if she could potentially qualify for the study. After an initial consultation, Hayley was invited back to have a fine needle aspiration to collect a tissue sample. This sample will be the final determination of whether or not Hayley will be accepted into the trial. “I arrived at the Breast Research Center, and I was a little bit nervous. I was about to have needles put in me! I was checked in right away and taken to my exam room. The staff was all very helpful and friendly. They quickly put my mind at ease. The nurse took my vitals and went over some paperwork with me that thoroughly explained the procedure, the after care, and what I should expect. She also explained a little bit more about the research study, and I was then feeling ready and prepared. Kandy and Amy came in to give me an initial exam and prepare me for my fine needle aspiration. They made casual conversation that relaxed me and made me feel comfortable. After explaining all of the steps, they turned on some soft music and low lights. I thought I was at the spa for a moment! They continued to engage me in conversation that kept my mind distracted and my nerves calm. They cleaned the area that they would be working around, and everything was ready. The only discomfort I experienced the entire time was a little pinch when the numbing medication was put in. After I was numb, I felt no pain at all, from start to finish. The procedure only took about 20 minutes, and I just rested and talked with the ladies as they worked. After they were done, I applied cold packs for a few minutes before they bandaged me up. It was over! The results will take about 4 to 6 weeks, and then I will know if I qualify for the flaxseed trial. I would definitely do it again, and I would recommend it to anyone interested. 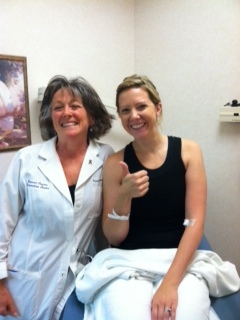 I will get to follow-up regularly with the clinic and stay on top of my breast health. This is important to me, especially as a person without good health insurance. This is a great opportunity to keep up on my own health and contribute to research! It only took about four weeks to get my aspiration results back. I was excited to find out that I did qualify for the study! The office set me up with another appointment to come back and finish the final steps to get me enrolled in the study. I was asked to fast the night before my appointment, and when I arrived, I had a blood draw. As usual, the office staff was very friendly and helpful. I did not have to wait long periods of time, which was important when I had my four-year old with me! Are you thinking about participating in a clinical trial? Don’t hesitate! It has been a great experience and opportunity to give back! Susan G. Komen has sustained a strong commitment to supporting research that will identify and deliver cures for breast cancer since it began over 30 years ago. This commitment has resulted in important progress that has contributed to major advances in breast cancer since our founding in 1982. With increasing investments over time, now totaling over $800 million, Komen is now the largest non-government funder of breast cancer research in the world. Our research focus has evolved over the years. 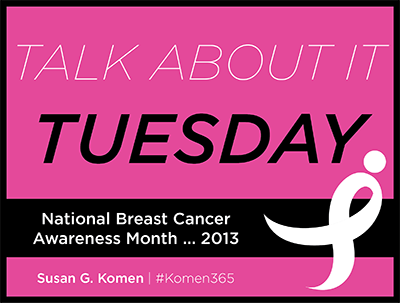 In the beginning we focused on understanding the basic biology of breast cancer. As we learn more about the factors that make cancer cells grow and spread, we are able to invest more in the translation of this knowledge into treatment, early detection and prevention. Our focus is to support work that has significant potential to lead to reductions in incidence and mortality within the decade. Our work isn’t done until our vision of a world without breast cancer is reached.